The other night I was trawling through photographs on my computer for a little project. Finding snapshots of each of the boys at various ages. Little Isaac, so tiny as a newborn. Xavier, the few I have him, treasured and precious. The literally thousands I have of Elijah, as though I could preserve his life through capturing each moment. Looking at your older children’s baby photos is always bitter-sweet, no matter what your experience. Gazing back with misty eyes on a baby-hood that will never repeat itself. Isaac’s sweet curls at 2 years old, his beaming smile at 1 year, his look of utter pride as he held both Xavier and Elijah for the first time. 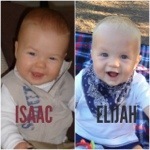 And as I looked through those photos, I could see Elijah in the photos of Isaac at eight months. Both boys full of cheek and joy. Sometimes I see echoes of the boys in each other, but nothing as poignant as a photo of Isaac with the same smile as Elijah. And I will never have that with Xavier. I will never know who he would have looked like at eight months, at one year, at two. I will never get to look back with misty eyes at once was – a joyful kind of melancholy. Photos of Xavier are precious and suspended in time. They speak of what was, but never what will be. There is no nostalgic reverie attached to them. There is only longing. What kind of little boy would Xavier have been? Active and quick thinking like Isaac? Would he have spread joy the way Elijah does? I will never know that version of Xavier. There is a folder within a folder within a folder on my computer labelled, “Xaviers last day”. No one aside from me has seen those photographs. I find myself looking at them from time to time. The most poignant are of each of our family and dearest friends giving Xavier goodbye kisses. At the conclusion of his hurried and cobbled-together baptism, each person silently bent over his hospital cot and bade him farewell. His little body, supported by machines, unresponsive as the last rites of love were bestowed on him. His baptism was one of holy water and tears. I look at the faces in those photos, drawn and pale. Everyone looks ten years older than they are. Grief and devastation bearing down on each of us. I look at Xavier. His tiny body intubated, hovering between life and death. But mostly I am drawn to the huddles that are inevitably in the out-of-focus background of each picture. Arms and hands entwined and each of us helping the other to stand. These photos aren’t easy to look at yet I am glad I have them. They are powerful and true. They will never hang on a wall or grace a photo album but they will remain, a testament to strength and love and family. In a world awash with images, in the share-happy culture of Instagram, these kinds of photos don’t really have a place. But they are precious and important. A photo doesn’t gain value by the number of people who see it. It’s value lies in how deeply it touches you. No photographs will ever touch me in quite the same way as the ones taken of Xavier. And photos of my living boys will always touch me in a different way because of Xavier. Forever remembered.